Time to look at your wages bill? It strikes us that one of the more important issues currently affecting the removals industry is the shortage of qualified drivers and removals personnel. There is a definite shortage of skilled labour. Why is this? One of the sessions at the Movers & Storers Show in Manchester during November was about holding onto European staff pre and post the ‘B’ word (I won’t say it because everyone immediately moves on to the next article…). This session has been covered in detail in a separate story, but we also want to consider another angle – the thorny issue of pay. Are you paying your staff enough? Chris Smallwood – a Director of Anchor Removals in Manchester – has a lot to say on this particular subject. He is passionate about ensuring his staff are well paid and feel proud to be part of the team. Have a look at the page on their website entitled – Mission – Our commitment to our staff, and consider how many other removal companies can boast this kind of mission statement? Part of their doctrine is to ensure their staff are paid the ‘Real Living Wage’. 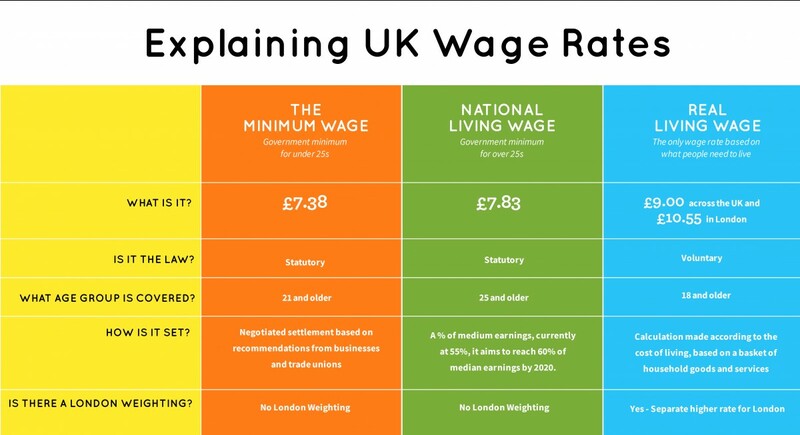 The Living Wage is based on the cost of living set by the Living Wage Foundation (LWF), an organisation that any employer can sign up to join. The National Living Wage was set up in 1999 as the brainchild of the then Labour government. It is set by the Low Pay Commission and is the legal minimum any employer should pay. The above figures exclude pension contributions and benefits in kind. In April next year the National Living Wage will increase to £8.21 which is a rise of just over 4%. That means from April next year we are literally talking pence per hour difference. So why should other removal firms pay the Real Living Wage? We can already hear many of you saying more cost…or questioning why they (road staff in particular) should get more money. Please go back and read the reasoning again. The question you should be asking is can you afford not to pay it? How many more key removalists can you afford to lose?